San Martin de los Andes, in the Argentinian province of Neuguen lies at the foot of the Andes mountain range by the border with Chile and is regarded as a gateway to the Lanin National Park. Perfect for anyone looking for an outdoor adventure but from a quieter base - you don't come here to party all night long. The best places to stay in San Martin de los Andes offer access to a stunning landscape and a wide range of outdoor activities all year round. San Martin was founded in 1898 as a centre for wood logging and husbandry and was modelled much like a European style alpine village. In 1937 the Lanin National Park was established (for which San Martin is the head quarters) and much of the original industry became obsolete. This forested park contains some of the most spectacular scenery in Patagonia, with numerous sparkling blue lakes, an extinct volcano and plenty of flora and fauna. The 1970’s saw the advent of tourism. Chapelco (12 miles away) is one of South America’s top ski resorts and in spring this is a bird watching mecca - the South American Bird Fair is held here every November. In summer there is kayaking, mountain biking, trekking, horseriding and golf. San Martin is also renowned for arts and crafts and epicurean delicacies - there are lots of great restaurants showcasing both Patagonian and Argentinian cuisine. Our pick of the best places to stay in San Martin de los Andes are both outside town, but ideal properties for making the most of this stunning location. 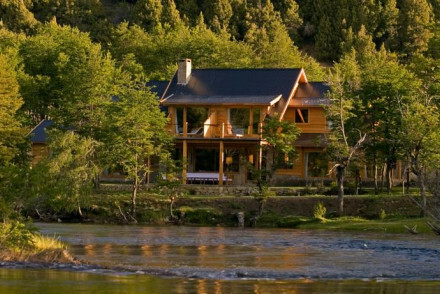 Rio Hermoso is a charming lodge in an enviable location set in pine forest beside a crystal clear river. The rooms have large glass windows with views to match. It is all very cosy - open fires, stone walls and pine. An ideal spot for walking and fly fishing. Estancia Huechahue is a boutique ranch set amid 15,000 acres! Rooms are cosy and traditional and the food is excellent. Come here for a luxury cowboy experience. The nearest airport to San Martin de los Andes is Chapelco (23 km away) with domestic connections to Buenos Aires. The best time of year to visit is between November and March, in the southern hemisphere summer. Temperatures range from 12-16 degrees celsius on average. A charming lodge with an enviable location besides a picture-perfect river and surrounded by gorgeous forests and mountains. Large glass windows allow for constant admiring of the views. Fireplaces, pine furniture and exposed stone give a cosy feel. The perfect spot to get back to nature. Back to Nature - A quaint lodge nestled amidst rugged pine forests and surrounded by mountains. Great walks - Spend hours wandering through the forest, following the river and admiring the mountains. Fishing - Take a course in fly-fishing.